Lobster and blueberries are synonymous with Maine. The Craft Beer market has firmly taken hold. But do you think of cheese when we mention Maine? Oh, yes! 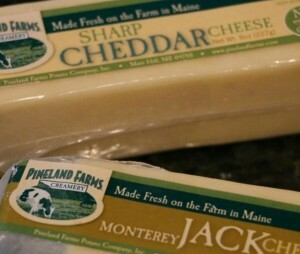 According to the Maine Cheese Guild, there are 80 licensed cheesemakers in the state of Maine. Compare that to Vermont, well known as a cheese making state, that only have just over 40. In fairness to Vermont, they do stipulate that they have more cheesemakers per capita than any other state. But, you can’t argue with those numbers. There’s a lot of cheese making being done in Maine. And their cheeses are amazing. With the exception of a handful of cheese makers, the majority of our Maine producers are located near or along the coastline of Maine, running from Portland up through Bar Harbor. They also range in size from small producers who sell at local farm stalls to larger producers that sell their cheeses in bigger retail stores in Maine and further afield. On the larger end are Pineland Farms. They are cheesemakers and a whole lot more. Located in New Gloucester, they are about an hour’s drive from Portland, just south of Lewiston. This 5,000 acre working farm includes a business and educational campus and recreational venue in addition to their cheese, all natural beef and potatoes! Here at the 1802 House Bed and Breakfast, we use their Cheddar and Monterey Jack cheeses in our Three Cheese Mushroom Omelets. Delicious. Because of their size, our local food suppliers have a plentiful stock of their products. If you ever find yourself near New Gloucester, they have a wonderful farm shop at their campus. Well worth a stop in to pick up some Maine made goodies. The Silvery Moon Creamery are in Westbrook, Maine on the outer edges of Portland and only a 30 minute drive from the Inn. This small artisan cheesemaker has a wide range of cheeses on offer at their farm shop (open seven days a week). The Smiling Hill Farm has been in the Knight family since the early 1700’s (proper Mainers!) and they started making their award winning cheeses in 2003. The current cheese maker is Dorothee Grimm who, with her apprentice Greer Walder, continue the cheese making process. No chemical fertilizers are used on this 500 acre farm. In addition to their cheeses, they are well known for their milk, butter and homemade ice creams. The milk for their products come from cows that have not been treated with antibiotics or growth hormones. 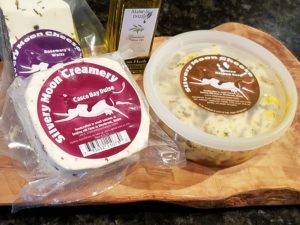 We love their Rosemary’s Waltz (coated in rosemary and juniper berries) and Tuscan Herbed Curd on crackers with a nice bottle of wine on our porch looking out over the golf course. Kennebunkport’s Mainely Drizzle are stocking several of their cheeses as well, so stop in there if you are in Dock Square shopping. If you’re looking for a really nice Chevre (goats cheese) the small Creeping Thyme Farm in Buxton, Maine has some beautiful cheeses. This small family owned dairy began with an interest in raising goats in 2007. By 2009, they were licensed and producing cheeses. In addition to their Chevre, they have a Chevre with Garlic and Herbs and a Chevre with Maple Syrup. Very different cheeses, but all three are creamy and delicious! They have a very nice Manchego that we also like to eat on crackers. They are adding to their products all the time so we’ve only just begun to sample their offerings! You can find their products at the farm (call ahead to make sure they are home) or at Jordan’s Farm Market in Portland’s Cape Elizabeth. In addition to using Maine made cheeses here at the Bed and Breakfast wherever we can do, many of the local restaurants in Kennebunkport are doing so as well. We look forward to sharing some of these wonderful new, and developing, artisan cheeses with you when you visit! This entry was posted in Food, Local Information by 1802House. Bookmark the permalink.